A good example is The Gilded Age (1873) by Mark Twain and Charles Dudley Warner, the first novel for both men, although they were both well established professional writers at that point. They divvied up plotlines, basically. The differences in style are severe and obvious. Twain sounds like Twain, and is often hilarious, even if he has no idea how to write a novel. Warner sounds like nobody, like mush. In the science fiction examples I have read (Strugatsky brothers, Niven and Pournelle, Space Merchants) I have no idea who wrote what or how the work was divided. As far as I could tell, the collaborations were seamless. There's no simple answer to this question because each book has its own unique aspects. But I had six Hammer novels each with about one-hundred pages; sometimes there were character and plot notes, sometimes not, and occasionally Mickey had roughed out the ending. 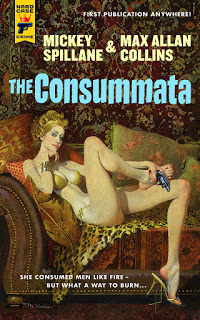 THE CONSUMMATA had about one-hundred pages, too, but no plot notes, and in fact who or what the Consummata was wasn't revealed - I spent a lot of time deciding whether it was a document or a piece of music or a person or...what. The reason it's hard to tell where Spillane stops and I start is that in the case of these 100-page manuscripts, I have revised and expanded them to around 200 pages of what will be a 300 page manuscript; that means two things: Spillane content goes deep into the novel; and the style is a combined one, truly collaborative. Of course it's not always that simple. In COMPLEX 90, Mickey had Mike Hammer (in the first chapter) summarizing a trip to Russia he'd made (during which he'd been arrested, broken jail, and had shoot-outs with Russian police) to Pentagon officials. I took that material and turned it into several chapters, taking the reader along for the ride, putting the sequence on stage, not just backstory. So the first chapter was Mickey, then several chapters were me, then it picks up with Mickey (or me revising and expanding Mickey). In LADY, GO DIE! - the earliest of the manuscripts, dating to '47, started right after I, THE JURY - the first chapter was missing. So I had to write it, obviously. I held that book back for a while till I was comfortable enough that I could get away with writing the first chapter of a Hammer novel. I also used, in that novel, a first chapter Mickey had written about a similar series of murders; I was able to weave that in right at the point I ran out of the original LADY, GO DIE! manuscript. Now and then Mickey had multiple drafts, very different. THE GOLIATH BONE and KISS HER GOODBYE, particularly, had variant versions of chapters. I used as much material from each version as possible. The recent KING OF THE WEEDS existed in numerous drafts, which I pulled together. For THE CONSUMMATA and the first six Hammer novels I completed, I consider the result to be a 50/50 collaboration. Yes, Mickey only wrote 100 of what would be a 300 page manuscript; but he created each story (plotting them to various degrees) and all the characters, from Mike Hammer to the spear carriers. I am thrilled and proud to have been chosen by Mickey for this rewarding task. Poor Warner. Thanks. The book sounds worth a look, if only to see if I can detect the differences as easily as you did. Are the stylistic differences so stark as to have been deliberate, a part of what the novel tried to do? Max: Thanks. I meant the post's title as rhetorical question because I suspected strongly that the books were more than a simple matter of picking up where Mickey had left off. But I never would have suspected that the Consummata was your invention, Knowing that, i can well understand how your decision might have necessitated revisions to what Spillane had written. You should give lectures on this stuff..
Max's comment on his challenges is fascinating. I think Twain and Warner were just doing the best they could with their respective chunks of the novel. AR(T): Panels about writing collaborations are a staple of crime fiction conventions. The collaborations generally involve such mechanisms as authors alternating chapters, then having the partner read and revise this chapters. I also once read of a case in which two authors became so immersed in their work that each began to write lines and jokes that would originally have been more characteristic of the other. I've wondered about this with the collaborative processes of my friends the Asawas, or as some people will come to think of them, the Zens, based on their collaborating under the name J. M. Zen to write mysteries. It must be a fairly different process from Max Allan Collin's or other writers working with a partially completed manuscript from a predecessor because they are a sister and brother act. I don't know a huge amount about their process, but I do know that one writes, then passes it on to the other, so there's a fair amount of back and forth in the initial writing itself. Having read their first novel, Horizon Drive, I'd be hard pressed to say who first came up with which part.Of course, it probably helps a lot to have known the other author your whole life. Seana: I am among those who think of them as the Zens, which is a sign they chose their pen name well. I remember a lot more readily than I do their real ones. Their way of working sounds something like that of Stanley Trollip and Michael Sears, who write together as Michael Stanley. The question becomes more interesting (to me, at least) when two writers who have written books and established voices of their own collaborate. This is the case with Ken Bruen's numerous collaborations, for example, as well as Max Allan Collins' completion of novels by Mickey Spillane. Well, it's all interesting. But I think it must be a good deal harder to follow up on an established writer with a strong writer with an established voice, and although it's clear that it's an honor even to be asked to make an attempt, it does seem very challenging. I think in our own era we think that the individual identity must be attributed, I get the sense that other periods were different. Creating your own brand wasn't viewed as such a big deal. One collaboration that comes to mind are the body farm books written by Dr. Bill Bass, who started the body farm at the University of Tennessee, and Jon Jefferson. I believe Jon Jefferson does most of the writing and Dr. Bass provides the scientific expertise. There are now five body farms in the U.S. to study the effects of different climate conditions. Seana, Mickey Spillane may have created a bigger brand than any other writer in American history. Also, Collins worked with Spillane and his manuscripts so long that working in or with his voice became less a problem than it might have been otherwise. Mary Beth, I don't know the names or the books, but I do do know of other collaborations in which one of the authors was an expert in a given field, and the other a writer. Silly me. I forgot to mention that they write under the combo name of Jefferson Bass. Yet another name I did not know, I'm afraid. Just this week I had found out about an upcoming thriller collaboration between Matt Rees, about whose work I have written several times, and a former Israeli diplomat. I would guess that that collaboration was similar to the Bass one. I also collaborate with two other writers -- my wife Barbara on the ANTIQUES mysteries (by "Barbara Allan") and on thrillers with Matthew Clemens (like the forthcoming FATE OF THE UNION). In both cases I co-plot and develop outlines/synopses with the other writer, who then does a shortish rough draft that I revise and expand into a final draft. Max: I know you're written about your various collaborations, but I don't remember seeing you discuss and compare them: How is working with, say, your wife, different from working with Clemens, and how do both differ from the unusual (I think) nature of your work Spillane. I would love to read a piece about this or hear you discuss it on a panel at a convention one of these years. Peter, I often joke that I don't sleep with Clemens. But otherwise the process is similar. The only major difference is that Barb and I develop the idea for the book together, whereas with Matt I usually come up with the premise and very, very basic plot. In either case brainstorming sessions give birth to collaborative synopses/outlines. Each writer gives me a book about 2/3's the length we've agreed to deliver; my draft fleshes things out, revises, tweaks, and so on. I do a complete final draft, and my touch (such as it is) is on every sentence. "It was creepy. I was scared and in a bad spot, trying to talk like Mike Hammer, and to nobody."